My earliest memory of Maundy Thursday (it actually could have been Good Friday) was when I was in elementary school. My dad was serving what would be his last settled pastorate, and a small portion of the congregation gathered in our country church for a solemn assembly observing Jesus' final hours. I don't remember much about the service, as I had the attention span of a goldfish (some say I still do). However, I do clearly remember the story of Jesus' final breath being taken. It was at this point that the organist played a loud chord, almost as if she just pulled out the stops and then slammed her hands on a few random keys. When that happened, the lights went out. We'd sit in darkness for a few moments until a single candle was lit in the chancel and the final words of the evening were spoken. In later years, I recall tenebrae being observed in a darkened sanctuary after a fellowship meal. A few high school kids would be recruited to don black robes and hoods, each holding a candle. After each reading, one of us would blow out a candle. Once we were in darkness, someone would sing two verses of "Were You There?" from the balcony. The first year that I experienced this had to be senior year of high school or later, because I remember being surprised and moved by the song. This remains for me the most meaningful element of any worship service I attend or lead all year. Tonight at my own little church on the hill, this will mark the end of our time together. 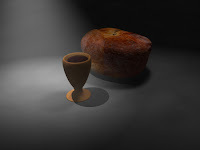 We'll observe communion by intinction and hear the tenebrae readings, helped along by music from The Last Temptation of Christ and Dead Can Dance. And then as we sit in darkness, "Were You There?" will echo through the room in a deep baritone voice. This puts Easter in its proper context. On Palm Sunday I strive to communicate that we don't just go from "Hosanna" to "Alleluia"...those who don't make it out for any mid-Holy Week offerings end up hearing the passion story anyway. As of late, I consider this in terms of Moltmann and his notion that we can't view Jesus' revelation of God apart from the cross. This goes beyond ideas about sacrifice or substitution or final victory...what does it mean to follow a crucified Lord, a suffering servant? It's the kind of thing that throws notions of "all-powerful God" and certain "Jesus as UFC fighter" images into serious question. Christians follow a Savior who dies. He has his final meal, he's beaten up, and he dies. Alone. Outside the city gates with the outcasts and criminals. He dies far away from squeaky-clean suburban megachurches and cute clapboard country chapels. He dies far away from our self-righteous protests and petitions, from the ongoing war to claim sole possession of the True Christian Voice. He dies far away from our bureaucracies and denominations and national headquarters and people decrying poverty while wearing tailor-made suits. He dies because of power instead of exhibiting it or claiming it or bestowing it. He dies for and with and as the poor. He dies. And as Christians we have to live with that. As Christians, we have to make sense of that. And that's really the only way for Easter to make any sense.